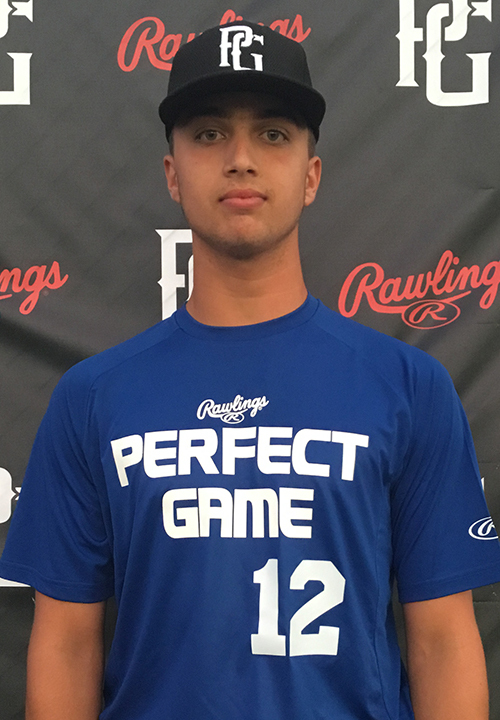 Loreto Siniscalchi is a 2021 RHP/IF, OF with a 6-2 190 lb. frame from Burnaby, BC who attends Ecole Alpha. Large, athletic frame with broad shoulders and present physical strength proportioned well throughout frame, long limbs with additional room to fill. Ran a 7.14 60-yard dash. Primary righthanded pitcher, simple side step moving into a leg lift just above belt; shows a short and quick arm action through the back working to an over-the-top release point. Lands slightly open with strike foot, does a nice job of working on top of the ball and generating plane. Fastball topped out at 84 mph, mostly true in life and maintained velocity well, shows ability and comfort to work to glove side with fastball. Curveball is a tight secondary, sharp 12-6 shape with bite down in the zone up to 72 mph and landed for strikes; mixed a changeup at 75 mph with short fading life to arm side. Similar strong arm from the outfield, works through the ball well with lower half, some bend at waist, loose arm action with carry to intended base. Lefthanded hitter, begins with a slightly open stance and a deep barrel wrap at the start of swing. Full swing path through the zone, shifts weight well through lower half, looks to lift at the point of contact with some uphill to path, works to all fields at point of contact. Very good student. Named to 14u National Top Prospect List. Selected to 2018 14u PG Select Festival.